This week, kids, kids games, and canine custody… all nicely nestled amongst 8 rather impressive pieces of music! Cinema trip – will we last the whole film? 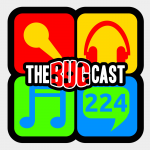 The next show will be episode 225 – broadcast live in the chatroom on Friday 24 August from 21:30 UK time.